Our comprehensive emergency call-out data centre service provides the reassurance that a Field Service Engineer will be dispatched to site in the event of an unplanned equipment failure. A combination of good design and planned preventative maintenance helps improve system reliability and increase system availability to the ideal figure of 99.999%. However, in the real world where system failures are a reality, Workspace Technology recommends the implementation of onsite emergency callout break fix support contracts. Our network of specialist engineers provides 24x365 emergency response across the UK. Typical Service Level response times are four hours or less. Field Service Engineers will diagnose and, where possible, repair faults during the initial callout. Workspace Technology also offers advanced deployment of ‘Site Spares’ kits for critical equipment which can significantly improve the meantime to repair providing engineers with instant access to replacement parts. Data centres have different levels of criticality depending on their purpose. Different types of plant will also have variable priority levels dependant on their potential impact on critical IT services. A flexible approach allows data centre service level agreements to be tailored in order to support individual customer requirements. Workspace Technology offers a range of Standard, Premium and Comprehensive, next day to 24/7 data centre service level options. Standard Routine maintenance with access to our call-out service. All newly supplied products are generally covered within warranty period. Premium As per Standard, but inclusive of call-out charges when newly supplied equipment is out the warranty period. 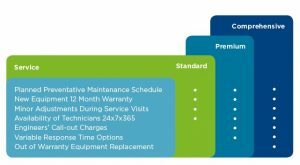 Comprehensive Provides full service including call-out charges and equipment replacement both in and out of warranty (subject to exclusions). Access to a nationwide pool of service engineers allows 24x365 emergency response to a wide range of mission critical equipment. Field service engineers can be dispatched to diagnose and, where possible, repair faults during the initial callout. The advanced deployment of 'Site Spares' kits on critical equipment can significantly improve the meantime to repair providing the field service engineers with instant access to specialist replacement parts. Contact us to organise your Emergency Call Out contract so that you can get back up and running as soon as possible. Located in Sutton Coldfield, Workspace Technology’s Technical Support Centre (TSC) provides advice and support to our service clients. The TSC team can be contacted via telephone, email and a web portal facility. A five stage, escalation procedure effectively manages fault handling and escalation processes. Our Client Portal offers secure access to a range of information and services including technical manuals and instant access to your data centre service contract details, along with planned maintenance dates and reports. Workspace Technology’s experienced and knowledgeable team are on hand to assist you in gaining the most out of your data centre infrastructure, ensuring that it is operating efficiently and effectively.